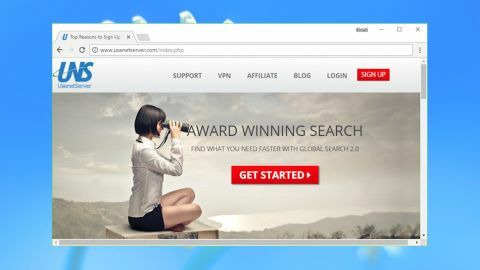 Newsgroup novices might struggle with the weak website and feeble VPN client, but the core service is great: fast, with lengthy retention, and it’s surprisingly cheap. UsenetServer is a popular Usenet provider owned by UNS Holdings, the company behind Newshosting, Easynews and many other services. The UsenetServer website highlights some appealing features: 3,363 days retention, over 100,000 newsgroups and 99% completion. You only get a maximum of 20 connections, while others often give you 30, 40 or more. Still, there's free SSL to keep your connection private, a VPN if you need it, and no transfer limits, speed caps or other irritating restrictions. While this sounds good, there's a distinct shortage of detail. UsenetServer has an "award winning search", the website claims, which is "new and improved." Which award did it win, and what has changed? The company doesn't want to tell us. This overly vague approach applies almost everywhere, with the website not even displaying any prices until you hit the Get Started button. Skeptical types might think UsenetServer is trying to hide something, but the reality is very different. You can pay monthly for $14.95 (£12), but the highlight is the annual plan, which adds a "zero-log VPN" and sees the price fall to a seriously cheap $7.95 (£6.35). This looks like excellent value to us, and a free trial gives you a chance to try it out for yourself. It's relatively limited at 14 days and up to 10GB data transfer – Newshosting gives you 30GB, some even more – but it's enough to sample the VPN, test retention for your favorite groups, and get a feel for the level of performance you'll get. What we do know is that the service includes free SSL support, encrypting connections to limit the ability of snoopers to see what you're doing. A VPN can further hide your identity by allocating you a new IP address from one of 21 possible countries. We had a small issue with UsenetServer's handling of our personal details. Not only did the company collect and store our billing address when we paid by PayPal, it also prominently displayed that address on the front page of our web control panel. If it must hold that data, we would prefer it to be stored separately and accessible to UsenetServer staff only, and not made instantly available to anyone who might gain access to the account. We noticed one other apparently interesting point in UsenetServer's terms of service, where it states the agreement is "governed by... Icelandic law". Could this mean you get more privacy rights than other countries? Many companies highlight the fact that they're based in some non-EU or US location, but this doesn't necessarily bring you any privacy benefits. Always check out the small print to find the real position. We headed off to UsenetServer's signup page to try out the service, and worked through the usual process, picking a plan, choosing a payment method (card or PayPal only) and entering our details. The company doesn't take any money immediately, but payments will kick in after 14 days or the 10GB data allowance has been used, whichever comes first. After confirming the order at PayPal, UsenetServer redirected us to a simple web page with the core details we needed to get started: username, password, the server name and port numbers (119 and 563, as usual). Unusually, the website also has a Global Search page which enables searching Usenet from your browser. Results can be filtered by date, for example to show matches in the last month, and you're able to download the matching NZB files in a couple of clicks. Open the NZB and as long as you have a suitable Usenet client installed, such as Usenet Wire, it should open and download the file for you. While this search feature may be a plus point for some people, it doesn't appear to be very well thought out. For example, if we logged in to UsenetServer's web console, then clicked the Global Search link, it opened outside the current security context and asked us to log in again, with the same credentials. We would have thought the company might have noticed that and fixed it, but apparently not. If you don't have a Usenet client then you'll need to find one, and UsenetServer doesn't make any significant effort to help you. We couldn't even find a simple list of packages that new users could try. We suspect it won't matter to most UsenetServer customers as they'll know precisely what they're doing, but it's still a concern when a provider doesn't highlight and explain something so basic. We did get a link to download and install the Windows VPN client, and that was entirely straightforward: download, install, then an icon popped up in our system tray a few seconds later. The client interface was simple, but very limited. You start by selecting a server from a list of cities and countries, with ping time stats to help you choose. A slider allows you to prioritize your connection for speed or security, and a Connect/Disconnect button turns the service on and off, and there's nothing else at all. There's no search box to find a particular location, for instance. No favorites system. No right-click menu on the system tray icon – not even a simple exit option. There are also no startup options, no DNS tweaking, no configurable kill switch, no settings of any kind. Even at this basic level, the Windows client isn't very well implemented. It raises a User Account Control prompt every time it launches. It uses its own desktop notifications which hang around for too long, and closing the client window disconnects you without any alert, rather than minimizing to the system tray. It feels more like a small app you've found on SourceForge, as opposed to a professional product. To be fair, if you only want to use the VPN when connecting to Usenet, this may not matter very much. And if you do need more power, you could simply ignore UsenetServer's own client and set up OpenVPN instead. For us, the main issue here is that once again UsenetServer isn't showing the level of professionalism or expertise that we would expect. Whatever the situation with the VPN software, we've no complaints about the underlying network. We had 21 countries to choose from, with locations including Australia, Brazil, Korea, New Zealand and Singapore, as well as the usual cities across Europe and North America. Our nearest UK server got close to 40Mbps download speeds, nearby European locations typically managed over 30Mbps, and even US servers got close to 30Mbps. In our experience, that's much better than you'll see with most specialist VPN services. The main Usenet server isn't going to hold you up, either. We managed to download at more than 40Mbps with just four connections, and there are 20 available if you need them. We completed our tests with a few simple retention checks, and again UsenetServer delivered, quickly finding and downloading binary and text files from the beginning of 2009. If you need to go way back in time, this is one service that may be able to help. UsenetServer is a poorly-presented service with a weak website, brief support articles, no bundled newsgroup software and a horribly basic Windows VPN client. And yet, experienced users who only need a good core service will find a lot to like here, including speedy downloads, high retention and a great value online plan. If that sounds appealing, use the free trial to see if it meets your needs. UsenetServer is offering an exclusive 65% discount on annual plans for TechRadar readers. Get it here for $7.95 per month.